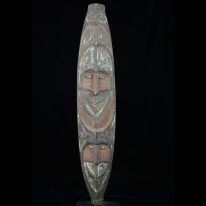 Bold Ancestor Mask, Blackwater River, Papua New Guinea. Because of the bold imagery and bright clay-based colors this mask looks much bigger than it is. We collected this one in the Blackwater River village of Kabriman. Trimmed with colored grasses. 23.75 inches tall.